the relationship between drivers and tech can be a touchy one. lots of drivers really don't like interacting with tech inspectors, they just kind of assume that it means trouble. and i have, at times over the years, seen incidents that would seem to justify this sort of reaction. but there's another type of driver and tech interaction that i'm blogging about today. from time to time, drivers will tell a tech inspector what they think is going on in their class. this can be pretty interesting, and usually happens at the beer party after the day's activities. i kind of like hearing this stuff - but drivers need to understand certain things about how i might (or might not) respond to their information. and it's rarely personal, unless something comes up that spins it that way. and the spin usually comes when the driver is being disingenuous about something. years ago, an ITS driver who is no longer active came up to me at the beer party and told me about all the stuff that he was sure the RX-7 ITS drivers were doing. i listened carefully, but didn't commit to a response (i generally don't). the funny part was that when i did impound ITS to check for the (mandatory) window glass and ride height later that season, this very driver had substituted plastic windows for glass windows in his doors - which is not permitted. this driver was clearly trying to use tech to go after other drivers in his class, and this is the sort of situation where if that is discovered, i might just take it personally - because i feel like someone is trying to play me for a fool. more recently i recall a National race where two drivers in showroom stock kept showing up in tech to describe bad things the other driver was doing that we should check. Really Guys? if you think he's cheating, file the protest and post the bond. or maybe get a room - either way, just leave tech out of it. we are not going to respond to this. If you do come up to me and suggest something that might be going on, I will probably not do anything right away. I may want to research, and may want to talk to other drivers in the class to get their take on things. I may need to take steps to get certain tools to the track. Even bringing something up a couple of days before a race is likely to not get anything done promptly. Tools may not be easily accessible. Two weeks is way more time than 3 or 4 days if you need something shipped or have to buy something. And I need to be careful about appearances; tech should not be perceived as responding to any particular driver's agenda, unless the agenda is clean racing. If you do contact me 2 weeks before a race to arrange equipment, you should be planning to file the mechanical protest, and not be trying to get me to impound someone you don't like. 1) file it early in the race weekend. that gives us time to decide how we're going to approach it. once the protest is filed, we can take steps to secure the vehicle and prepare for whatever is needed. for intrusive things, we might seal the engine and plan for disassembly after the race. and by the way, be aware that mechanical protests filed in the last hour before the race are not timely and won't go anywhere. 2) don't offer us tools. the protested party will use their own tools for any disassembly, under supervision of a tech inspector. after disassembly, tech can't use measurement tools supplied by a party to the protest. on one occasion, a bunch of drivers got together to file a protest of one of their competitors, and since they'd planned well in advance, they brought some very nice tools to the track for the needed measurements. they were very offended when we told them we couldn't use them - but if we had, there would have been nothing but trouble down the line. i seriously doubt we would have made it past the committee at the track if we'd used the protestor's tools to measure the protested engine. There are some useful things in NEDiv that can be at the track, but they won't necessarily spontaneously appear. 1) bore and stroke gauges for center plug engines. yes, we can bore and stroke some cars without pulling heads, but not all of them. but we won't necessarily have these tools at every race. 3) some regions have puff testers, which can be used to measure displacement in some motors - in particular, american pushrod v-8s are candidates for this measurement. If I knew in advance I might need this stuff, it can certainly be at the track. Guys, the old Spec Racer Ford rain tires haven't been permitted for a year now. The numbers are right on the side, and they're faster than the new tires, so if you think you can get away with it, you're fooling yourselves. If a competitor files a protest, you will lose. Let's try that self policing thing. The numbers are on the side of the tires, out where you can see them, and if you protest someone running the old tires, you will win. There's no tear down bond involved, just a protest fee, which, if memory serves, you get back. Note that the lettering is filled in. If this label had been tampered with, the silver "fill" for the letters would be missing. Last November at the NEDiv SCCA mini convention, a friend of mine came to me with an issue. he'd acquired a Hutchins Device (one of the modern head & neck restraint systems) on ebay, and was concerned because the word "void" showed up on the certification stickers. Stickers of this type have been around for around 12 years. they're designed so that when you peel them off, the word void appears. having the word void show up on a legitimate item which has not been tampered with would be a bit of a problem. discussion at the time suggested the problem was because the device was clear coated carbon fiber, and light was getting behind the stickers. on Saturday, i went to Long Island to do annual inspections for a bunch of SCCA race cars, and of course got to inspect driver gear. since the restraint systems are mandatory this year, i saw a bunch of those too. what was interested was that all the new HANS devices were matte finish, no clear coat. they did not have problems with the FIA & SFI certification stickers. there was one older HANS, clear coated, and sure enough, the word VOID showed up. we're going to have to do some training of tech inspectors on this. it's possible to tell if a sticker has been tampered with or not, you just need to think through it. when we peel off a helmet sticker, the material that fills the word void physically pulls away from the sticker. 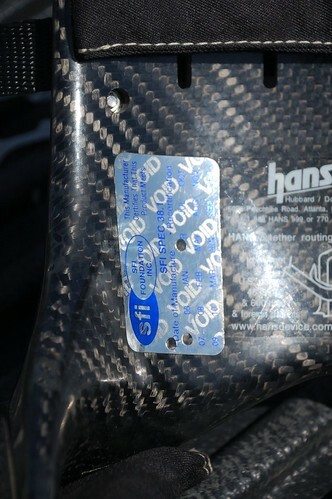 when the word void shows up on a clear coated HANS device, the shiny fill is not missing, you just see a thin outline around the word void. these latter stickers are fine. This update from the March Fastrack was just brought to my attention (thanks to Greg Amy/Scott Dowd of NER). Adjustable seat rails for driver's seats have always been an issue. the CRB has just issued an update to 9.3.41 (page 99, the 2011 GCR) clarifying one key detail. There is now only one tiny exception to the seat back brace requirement. The number of cars which will qualify for this exception is vanishingly small. If you have sliders under your driver's seat, even if they're FIA sliders, chances are you need a seat back brace, and since it's in March Fastrack, you need the brace before your next event. UPDATE if you race in a part of the country that doesn't do safety waivers (like NEDiv), and if you have sliders and are missing the seat back brace, we will have no choice but to send you home. SFI labeled gear manufactured in 2008 and prior years from Impact Racing products are not eligible for use in SCCA competition. And remember: current SCCA policy is no Safety Waivers. No one is going to give you a "fix by next event note" and let you race. No one. By the way, here is the Official SCCA Club Racing memo on the situation. Note that the SCCA regards the 2008 and earlier Impact gear as decertified, but is delaying enforcement for an as yet unspecified period of time. I'll say up front that I find it very hard to believe that Bill Simpson would knowingly participate in anything of this sort. He has a very long association with race safety and was directly involved in many crucial innovations such as Nomex(tm) suits. This sounds more like the work of a mediocre business school graduate applying standard logic about leveraging the reputation while cheapening the product to improve margins. The fact that this stopped happening with the 2009 production year suggests that this imagined business school graduate either smartened up or got fired. The real problem is that the old stuff is still out there, in race cars and hanging in driver's closets. And the reason why I say mediocre is that you can sort of get away with this kind of logic if you're selling fast food, but race safety is no place to fool around. Two notes to add on this issue: the SFI decertification does not impact any parallel FIA certifications. For those items where the SCCA accepts FIA certifications, an Impact Racing products item that has an FIA label remains (for the moment) acceptable per that certification.